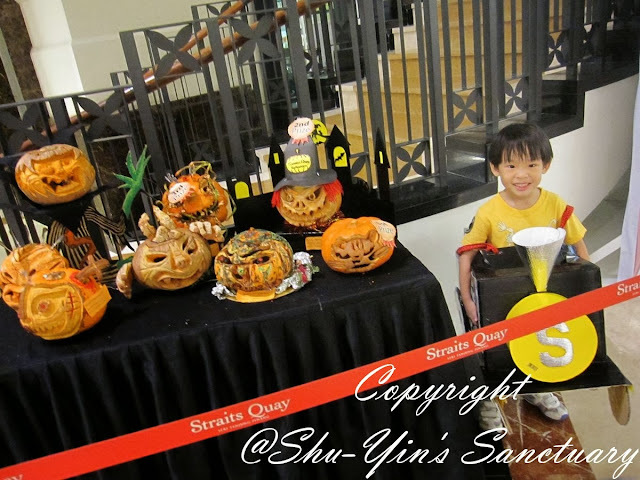 Shu-Yin's Sanctuary: Shern's First Halloween with Trick-Or-Treating! 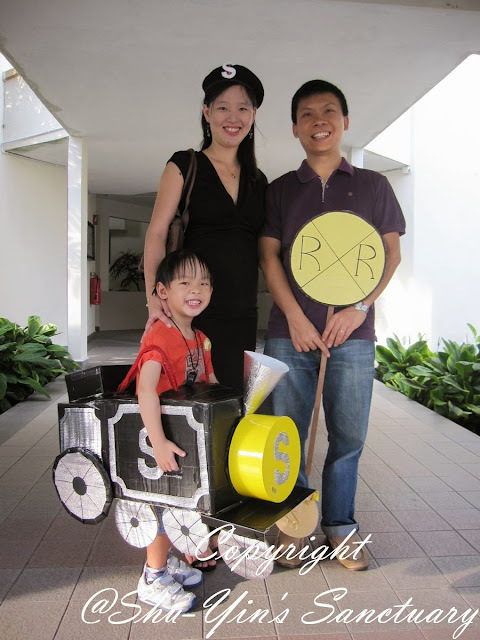 After my labour of love making his train costume, it was time for Shern to go Trick-or-Treating! 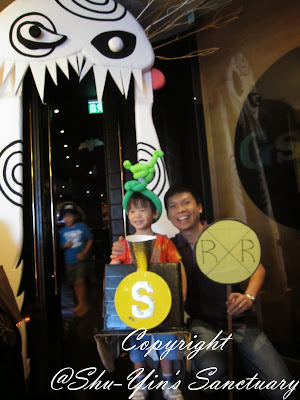 But too bad both my boys got sick a during the Sunday of the Trick or Treat session at Straits Quay. So we had to miss that. But I heard that the session at SQ was badly organized was pretty chaotic,with parents shouting at organizers and some kids had to go without candies, so I guess it was good we missed that. 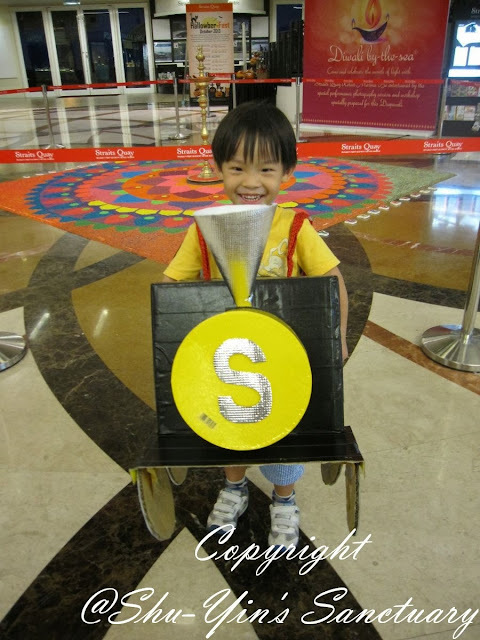 So since we missed that, I decided to just bring Shern over to Straits Quay on the real Halloween Day and just go do his Trick-or-Treating on some shops. Don't care if they hadn't got any candies for him, I would just provide some for them to give him. 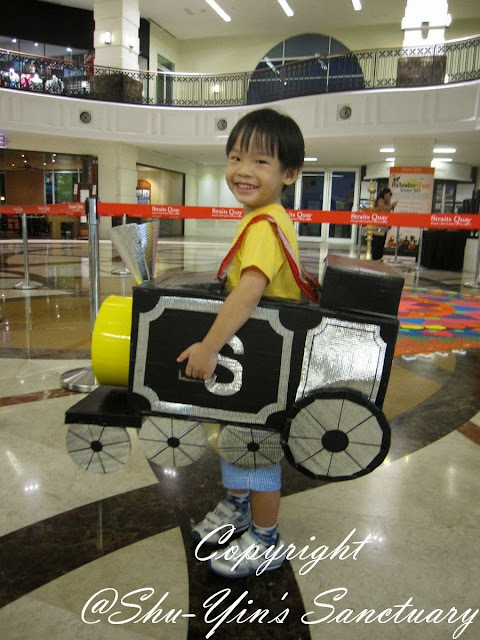 This is Shern all geared up in his Train Costume. 31 October 2013 - Halloween Day! First stop was actually Blue Reef restaurant. For the occasion, some of the staff painted their faces for the Halloween and it was really fun. 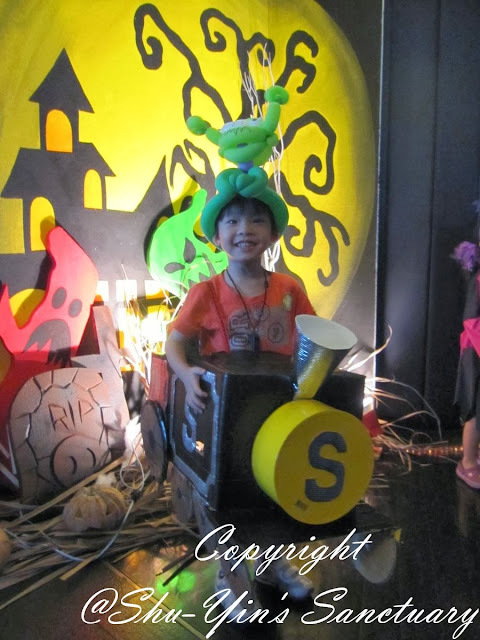 Shern knew some of the staff there after having his birthday party there just a few months back, so it was a friendly Trick or Treating sesson.. He left with a handful of candies. Too bad we forgot to take a photo there. 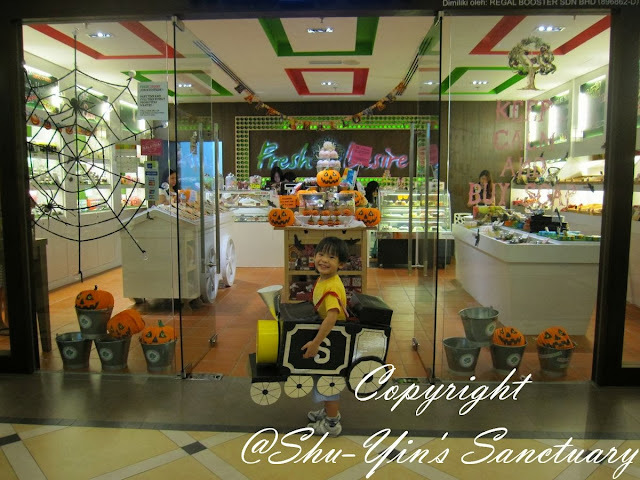 The Fresh Desire opposite Blue Reef had some nice Halloween Deco there too. The staff there were pretty amused with him, especially when he went in saying "Chugga chugga choo choo...make way...train is coming!" Next stop was Huey & Wah. He loved seeing Huey yee-yee and Uncle Ah Wah and he got a big pack of marshmallows from them! We went too other shops such as Real Food, where they gave him some organic gummies. And they even took a photo of him. 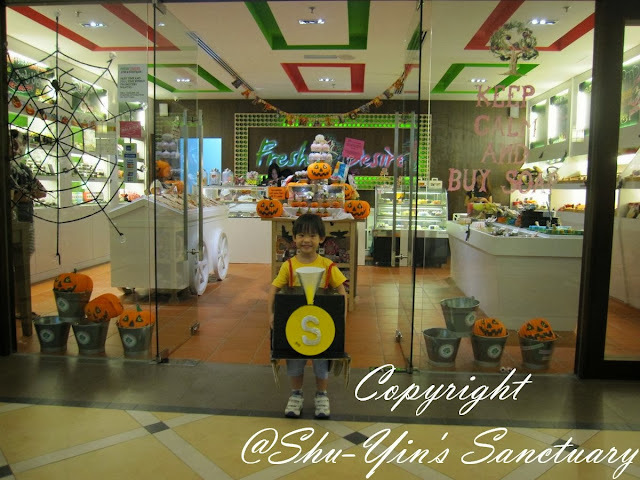 Some of the shops didn't have candies for him, and Shern asked 'When I say Trick or Treat, you are supposed to give me sweets you know!' lol. Went over to Healy Mac's as well, and it was all dark and spooky inside. They were dressed in vampires and zombies and all. Luckily Shern weren't afraid. A small deco of the carved pumpkins. And a photo of the grandparents with Shern and Khye before we call it a night. 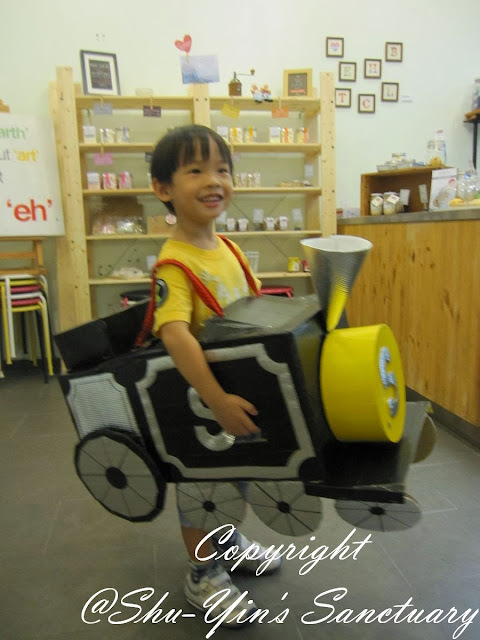 Not bad that the train costume lasted well for the 1 hr of Trick or Treat session, although it had a Pit Stop whereby me and mum scotch tape some loose parts. And I also signed us up for the Kid-Friendly Halloween Disco Party. 3 of us went as I guess Disco theme is not so appropriate for 1 yr olds. 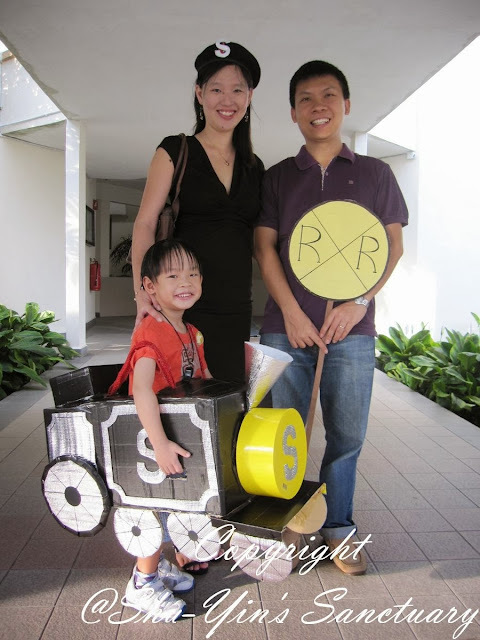 Mum and aunt tried to make the train costume a little more sturdier to endure more bangs (yes, sometimes Shern accidentally bang it onto walls!) and such, so they helped to sew some parts. 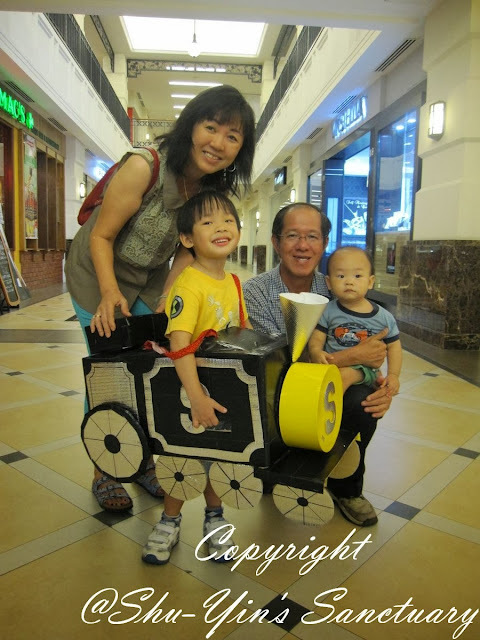 So the wheels are now sewn into the train body. Yay, no more half-dangling wheels! lol. Thanks mum and ahyee. So 3 of us got ready for our next Halloween Disco Party the very next day from 6-8pm. Shern was the train in his Train Costume, I was the conductor with the beret Min lent me and a whistle (which Shern insisted is his! ), and hubby was the erm, Railway Road signage. Anyhow, both hubby and me were his entourage for the night. He got his candies, and even a mini torch light at the entrance. He even got to bring home a bag of glow-in-the-dark creepy crawlies! 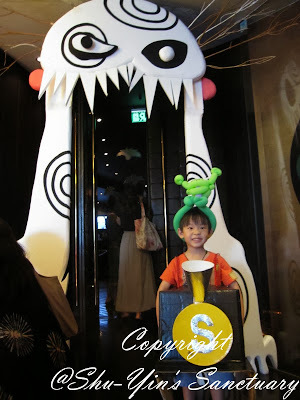 He immediately got a Monster Balloon Hat from he magician who performed that night. And this is the entrance to our disco place. It was very dark inside and so most photos turned up real blur and darkish. So no photos inside. But it was decorated so nicely, with glowing pumpkins, spooky bats hanging and such. 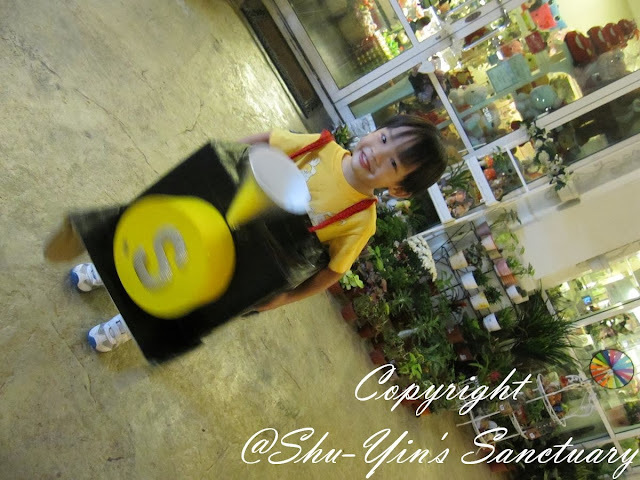 And there were many kids around Shern's age, dressing up. We saw pirate, dragon, witch, pumpkin, fairies, bear, etc. The kids were having so much fun just playing and chasing around the black and purple balloons all over the place. Some adults dressed in zombies and ghosts costumes. And when some kid stared at them looking scared, they would remove their masks to reveal their face and give them a high five. I like that, as they are not trying to scare the kids, but to show them they are only costumes. Really kid friendly indeed. There was a simple buffet supper spread. Food was kid-friendly and delicious. I ate a big plate of spaghetti, fish fingers, pizzas, and fruit kebabs dipped in choc sauce. Yummy. We made some new friends and it was a very fun night. We will definitely be back the next year.